The light curves you see on Planet Hunters are not always the light of a single star. Kepler has very very precise but blurry vision. The CCD pixels on Kepler’s focal plane are very big, four arcseconds to be exact. The light measured at each observation from several of these pixels are added together to create the light curve you see on Planet Hunters. So what does this exactly mean? In some cases the Kepler stars are pretty isolated, but in others there are fainter background stars that appear nearby in the sky can get blended with the light from the Kepler target star. It turns out you can hide a lot within 4 arcseconds. This stellar contamination can impact what we see in the final light curve. If the main Kepler star has a transiting planet, the contaminating star can dilute the transits. The transits will look shallower than they really are, and you’ll estimate a small planet radius. Sometimes the fainter contaminating star is an eclipsing binary. Combined with the light from the brighter Kepler target star, the stellar eclipses from the eclipsing binary are diluted. The secondary eclipse (when the fainter cooler star goes behind the larger brighter star and the smaller cooler star’s light is blocked out) can be diluted such that it’s not seen and the primary stellar eclipse (when the smaller cooler star transits in front of the larger brighter star and blocks out a portion of the brighter star’s light) get shallower, looking like a planet transit. Other times depending on the brightness of the eclipsing binary, it will look like the main Kepler target is the eclipsing binary when it’s not. This is something the Kepler mission always had to deal with and there are some observational checks and data tests that can help determine whether the transit-like signal is likely coming from the actual Kepler target star. You can take follow-up observations like we did for PH1 b and PH2 b using telescopes with adaptive optics that minimize the blurring effects of the Earth’s atmosphere to zoom in around the Kepler target star to look for contaminating stars. Also you can look for shifts in the position of the brightest pixel during and before and after a transit which signals the transit signal isn’t coming from the primary Kepler target star. Also you can look at the individual pixel by pixel light curves from Kepler (Kepler reads out a subimage around each target star and a small number of those pixels get added together to make the Kepler light curve)and see if the transit signal or eclipsing binary signal is present in every pixel or if you see say an eclipsing binary signal in one pixel making the light curve and in pixels near by around a different star. Here’s an example from some of the Planet Hunters volunteers who examined to see if an eclipsing binary was contaminating a light curve. Despite Kepler’s slightly blurry eyes, we can use a host of techniques to try and rule out false positives, identify where there is stellar contamination, and still find planets. So bear this in mind when you see the light curves, that although it’s likely most of the star’s light is from the Kepler target star, a tiny portion (in most cases) is contributed by neighboring stars. Today we have a guest post from Scott Fleming. Scott is a scientist at the Space Telescope Science Institute, located in Baltimore, MD, USA, where he works on the data archives. His research interests include eclipsing binaries, stellar astrophysics, brown dwarfs, and extrasolar planets. Today Scott is here to tell you a more about MAST, the online public data archive where the Planet Hunters team obtain the Kepler light curves that are processed and eventually show up on the Planet Hunters site for you to classify. The Mikulski Archive for Space Telescopes (MAST) is the official archive of data from NASA-funded space telescopes. We primarily house data from ultraviolet and optical space telescopes. Some of the missions we support include GALEX, the Hubble Space Telescope, the James Webb Space Telescope (after it launches), and of course, Kepler. We also archive, and plan to archive, data from many other missions that have launched over the past 40 years, ranging from the 1970’s to future space and ground-based telescopes. Our role in the Kepler mission is to serve as the Data Management Center. This means that, in addition to some data processing, we archive the lightcurve data itself (the timestamps, fluxes, flux uncertainties), as well as information related to each observation that’s required for calibration purposes, and catalog information that contains data on the host stars (their brightness in different wavelengths, estimates of their temperatures and sizes, etc). We primarily serve professional researchers by facilitating access to the data, enabling powerful search capabilities so they can locate the data they need for their research, and providing tools that allow the scientists to preview and visualize the data before they download it to their machines for further analysis. However, we do have some online tools that are used by educators and amateur astronomers as well. Our newest tool is the MAST Discovery Portal. This online search interface allows users to enter coordinates or target names and do a search for data across many missions all at once. This is kind of like a “Google” for astronomical data, where users can discover observations that may have been taken on their objects, even if they weren’t aware of its existence beforehand. You can enter the coordinates or name of a Kepler star, for example, and discover what other data exist by searching “All MAST Observations” or the “All Virtual Observatory Collections” in the top-left menu. The Virtual Observatory is an online service that provides access to data from other astronomical archives around the world. This allows users to search not only the ultraviolet and optical data at MAST, but also data in the radio, infrared, x-ray, and gamma-ray. 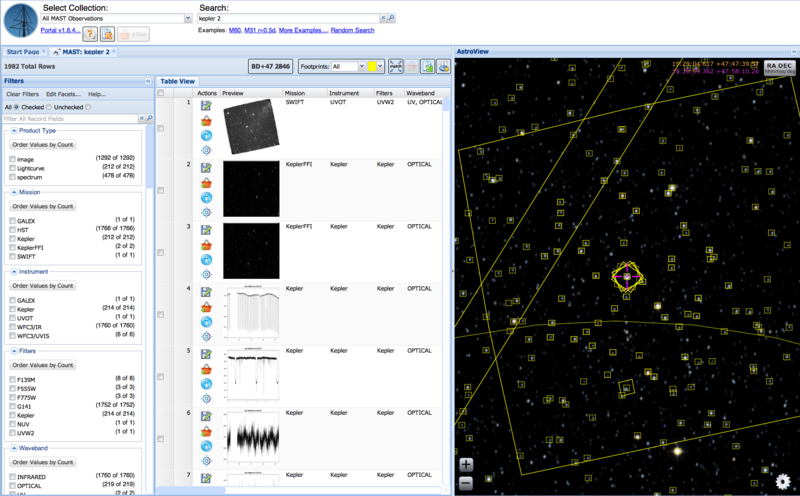 The Discovery Portal includes an AstroViewer. Using background images of the sky created from ground-based surveys, users can see the “footprints” (i.e., the field-of-view) of a given piece of data, and see exactly where your objects lie inside. If you’d like to try it out, do a search on “Kepler 2”. In the AstroViewer on the right-hand-side of the screen you will see lots of footprints appear. The small squares around stars in the field are from Kepler; they show which stars Kepler looked at in the field. Our target, Kepler 2, is automatically centered in the AstroViewer. You will notice larger squares around it, which are the footprints of data observed with the Hubble Space Telescope. If you zoom out to larger scales using the “minus” button on the lower-left corner of the AstroViewer, you will start to see very large squares and circles. The biggest squares come from the Swift space telescope, while the large circle is an observation from the ultraviolet GALEX space telescope. You can see how this visualization of data from many missions allows users to discover new data on their targets, and look for cross-mission overlap that can enable new kinds of science when multiple instruments observe the same target. Feel free to try out the Discovery Portal for yourself. There is no registration or login required. You can follow MAST online on Facebook and follow us on Twitter @MAST_News. Although our posts are directed at professional astronomers to alert them when new data and tools are available at MAST, it’s still a way to keep up-to-tabs on what new projects are happening in the professional astronomy circles. In May, Kepler lost its 2nd reaction wheel halting continuing observations of the Kepler field and its original exoplanet mission. Later this summer, NASA announced that attempts to revive the broken reaction wheels had failed, and that was the official end to the observations of the Kepler field with the 30 ppm (parts per million) precision obtained with the 3-wheel pointing. Other than the bum leg, the spacecraft and imager were in good condition. NASA issued a call for white papers soliciting ideas for potential use cases for a 2-wheeled Kepler. It was announced two weeks ago at the 2nd Kepler Science Conference, that the Kepler team has a plan to return Kepler to exoplanet hunting that they will be proposing to NASA to give the go ahead and fund. They are dubbing this new 2-wheeled mission for Kepler ‘K2’. You might be inclined to call ‘K2’ Zombie Kepler, but in reality Kepler hasn’t gone anywhere. After the 2nd reaction wheel failure, the spacecraft has just been resting while NASA and Ball Aerospace engineers have been working on ways they could use the remaining two reaction wheels and thrusters to do exoplanet science. In the past few weeks Kepler has been taking engineering data to test stability and photometric precision in this K2 pointing/observing scheme. Here’s how K2 works. With the loss of the 3rd reaction wheel, Kepler lost fine tuning in one of three spatial directions. If Kepler is pointed keeping the Sun in the X-Y plane, there’s a pointing ridge where they can balance the spacecraft and use the remaining wheels and thrusters to keep pointing. That means fields have to be in the ecliptic (plane of the Earth’s orbit). With that pointing very little changes to the current Kepler team data pipeline are needed to produce light curves with the same 29.4 minute cadence. The photometric precision is predicted to be better than 300 ppm (measured from preliminary engineering runs and testing). So there is a loss of sensitivity, 3-wheeled Kepler had 30 ppm photometric precision. Still Kepler can detect giant planets and for both bright and small stars, Kepler can detect rocky planets. Kepler will not be able to stare at any one field for very long. The fields on the ecliptic would change as the Kepler orbits the Sun. Each field would get ~40 days worth of observations with some craft pointings able to extend the baseline to ~70-80 days. Also the number of pixels per star needs to be increased significantly, and since Kepler has a limited memory on board to store all of this data, the number of stars observed needs to significantly decreased from the over 160,000 stars monitored when observing the Kepler field. 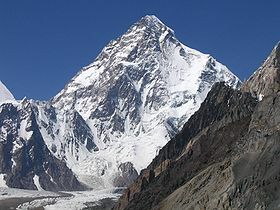 10,000-20,000 stars would be monitored in K2. The K2 data, like that in the Kepler extended mission, would be available to the public and scientific community after it was downloaded and reduced. The exciting prospect is that Kepler would observe different populations of stars than the Kepler field, which will be interesting to see how the frequencies of planets compares to the Kepler field. Not to forget, the prospect of having many many more new planets/planet candidates to characterize and study. There will be also be observing of cooler M dwarf stars where the habitable zone (the goldilocks region where water might exist on a rocky planet’s surface) is close to the star, and thus Kepler will find many more rocky planets in the habitable zone to further study. Also bright stars will be targeted which will enable ground-based follow-up with the radial velocity technique, which for gas giant planets can actually measure masses and confirm these planets. Also there’s a wealth of stellar astrophysics (and even potentially microlensing monitoring ) that could be done with K2, including observing stars in open clusters (conglomeration of stars loosely bound together that were all formed from the same molecular cloud) where we know their ages. K2 is a mission concept at this point. The Kepler team is working hard, and has achieved or on track to finish software upgrades needed to enable Kepler to point and track on ecliptic fields for K2. Test data is starting to coming down from the spacecraft. The Kepler scientists and engineers are analyzing the data and assessing the data quality from K2-like observing. In the next few weeks the Kepler team will propose K2 to NASA, in December NASA will decide if K2 is viable and then give the go ahead for the Kepler team to propose for K2 in the senior review in April, where Kepler as well as other NASA missions will be examined and funding will be decided. Let us hope that K2 gets the full go ahead with (cross our fingers) observations starting some time in 2014. The prospects for K2 are exciting, and I hope the missions gets the green light. I think the place for Planet Hunters in the K2 era is interesting. I think there will be a niche for Planet Hunters, especially with the short time span on each field, identifying single transits will be important for follow-up of the planetary systems discovered. There will be new eclipsing binaries monitored, and the prospect for more circumbinary planets which is also where I can see Planet Hunters contributing. Plus don’t forget the unexpected discoveries waiting to be found, as we’ve learned from the Kepler field data. So bring on K2! Want to know more about the proposed K2 mission? Watch the 2nd Kepler Science Conference talks by Charlie Sobeck and Steve Howell detailing the specifics about K2. What to do with a 2-wheeled Kepler? Now that Kepler is officially 2-wheeled, NASA and the Kepler team are looking at what Kepler could be re-purposed to do. Except for having a bum leg, the rest of Kepler is in good shape. NASA put out a call for white papers, detailed proposals for ideas for what to potentially do next with Kepler. There was no shortage of ideas. In total there were 42 white papers. The proposed ideas ranged from studying the photometric variability of Active Galactic Nuclei (AGN) to a microlensing planet search. There is even a white paper from Kepler’s Principal Investigator (PI) Bill Borucki on how Kepler could continue exoplanet observations (though perhaps not at the same precision before the wheel failure). There are also other proposed options to do an exoplanet transit search by targeting new fields where the Kepler pointing would be better than going back to the the current Kepler field, though likely the observation span would be different from that before the reaction wheel failure. There are even proposals to stay the course and continue to follow-up the Kepler field even with the reduced sensitivity to transit depth with the aim of monitoring known Kepler planetary systems for transit timing variations (TTVs) and also look for long period giant planets. If you’re interested in reading about all the proposed ideas in gory detail, all the white papers are online and freely available on the Kepler Guest Observer website. If you’re interested in the abridged version, Astrobites has an excellent summary by Nick Ballering highlighting the main categories of use cases proposed. Some time in the Spring of 2014, NASA will decide on an alternative plan for Kepler and hopefully if there is funding, Kepler will be taking data in the Fall of 2014 whether it’s looking for exoplanets, searching for Near Earth Asteroids, or something else. Today brought some incredibly sad news to planet hunters everywhere. The Kepler satellite, which has provided all the data which has fed our site since the beginning, has probably reached the end of its useful life, at least as far as hunting for planets goes. 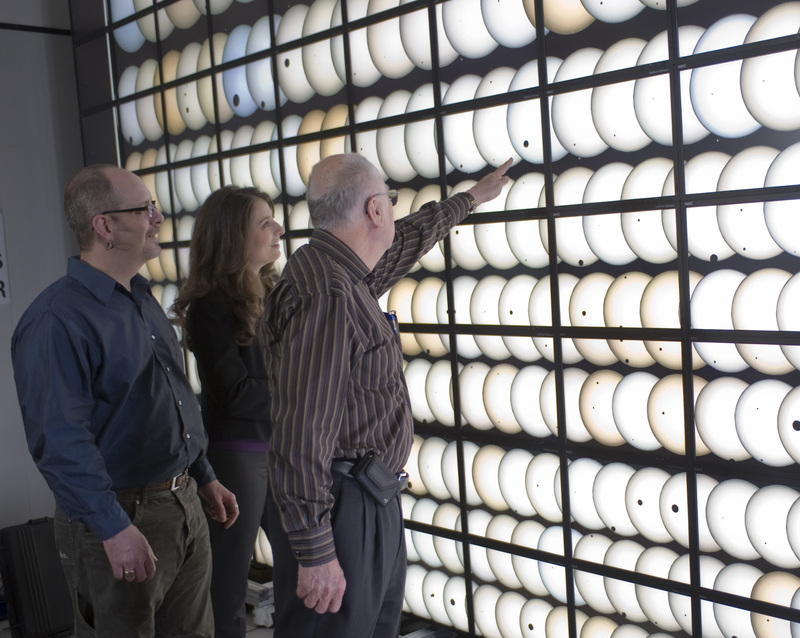 Kepler team members (& friends of Planet Hunters) Jon Jenkins, Natalie Batalha and Bill Borucki look at Kepler data in an artful press shot. They’re just three of the team who have devoted such care to Kepler. Facts first. As reported elsewhere, Kepler’s fourth reaction wheel seems to have failed. The reaction wheels are what the spacecraft uses to point accurately, and with this failure Kepler’s down to only two, not the three needed to point precisely at its targets. Without three functioning reaction wheels, Kepler won’t be able to hold its gaze on the part of the sky that hold the stars that we’ve all become so familiar with over the last few years. There are still things to be tried – most of them variants on the tried and trusted ‘turn off and turn back on again’ methods – but the participants in today’s press conference didn’t seem very confident. The likely best case scenario involves Kepler being placed into a stable mode while those of us left on Earth spend the next few months contemplating what else it might be used for (budgets notwithstanding). So where does this leave Planet Hunters? Bill Borucki – Kepler’s indefatigable principal investigator – was at pains during the press conference to stress that there is plenty of science left in the data that the spacecraft has already sent to Earth. He believes (and who are we to doubt) that Kepler already has enough information on hand to satisfy the critical science goal of determining what the odds of an Earth-sized planet are. There is a year or so of data that hasn’t been seriously reviewed by anyone, and much less than half of the data supplied has ever been viewed by Planet Hunters. In the long run, there are other data sets (the European COROT mission might be worth a look) and future missions (NASA’s TESS will follow where Kepler led, but looking for nearby planets). Those discussions are for the days to come, though. For now, I want to pay tribute to the people behind the spacecraft. There’s a temptation at times like this to anthropomorize, to feel sorry for our plucky little planet hunter way up in space. Yet the truth is a mission like Kepler is what it is because of the blood, sweat and tears of hundreds of people, many of whom have dedicated literally years of their lives. I don’t know Bill Borucki well, but I first met him when I interviewed him for the BBC’s Sky at Night program. What struck me then, apart from his relaxed humility, was the tale he spun of year after year pitching what was to become Kepler only to be told that his ideas were unrealistic. Most people would have given up, but Bill and his team pressed on and as a result of that dedication were in the right place at the right time when the time came for an exoplanet mission to be picked. The Kepler team are scattered across the US, and indeed across the world this evening. I hope many of them will be raising a glass to (what seems to be) the end of a job well done. Before we join them, the least we can do is go and look at some of their data they collected – after all, we still don’t know what’s lurking in the Kepler data displayed at Planet Hunters.